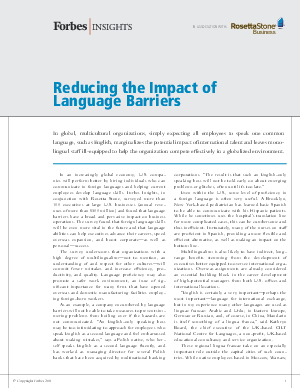 In global, multicultural organizations, simply expecting all employees to speak one common language, such as English, marginalizes the potential impact of international talent and leaves monolingual staff ill-equipped to help the organization compete effectively in a globalized environment. In an increasingly global economy, U.S. companies will perform better by hiring individuals who can communicate in foreign languages and helping current employees develop language skills. Forbes Insights, in conjunction with Rosetta Stone, surveyed more than 100 executives at large U.S. businesses (annual revenues of more than $500 million) and found that language barriers have a broad and pervasive impact on business operations. The survey found that foreign language skills will be even more vital in the future and that language abilities can help executives advance their careers, speed overseas expansion, and boost corporate—as well as personal—success.